Southern Tuscany is one of the most romantic choices for anyone planning to get married in Tuscany. Away from the main tourist areas you will find many small beautiful towns such as Pienza or Cortona that will captivate you with their special flair. The endless panorama is dotted with idyllic sites and surrounded by the rolling Tuscan hills – the perfect backdrop to the wedding of your dreams in Italy. Set in the Tuscan province of Siena are the beautiful towns of Pienza, Montepulciano, and Montalcino, which seem to have been especially created to host civil weddings thanks to their romantic scenery. Pienza – located in Val d’Orcia – has a charming historic town centre, which is also a designated UNESCO World Heritage Site. 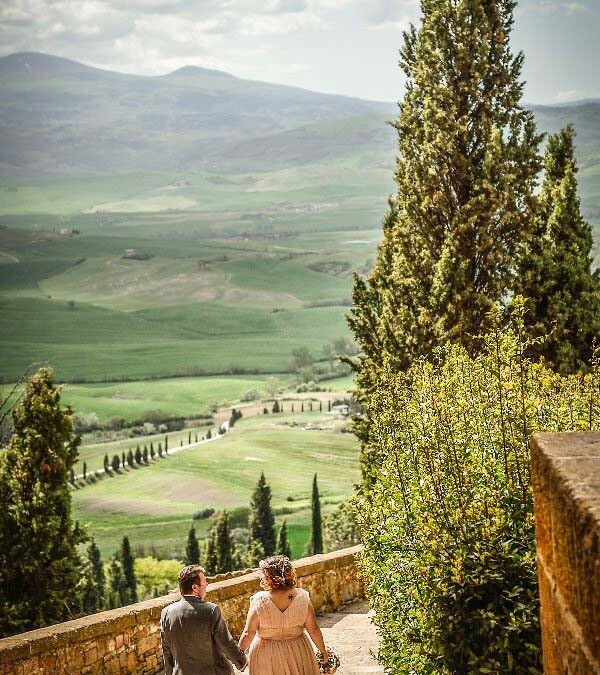 Surrounded by dreamlike landscapes and exceptional views, Pienza is the ideal location for a unique wedding. Notable attractions include the cathedral, the many Gothic churches, and the Ammannati Palace. The Val d’Orcia, where Pienza is located, is a UNESCO World Heritage Site that consists of a collection of exceptional landscapes. Located the southern part of Siena province, the valley has inspired many artists who came here attracted by the local wines and the unrivalled scenery. Also in Val d’Orcia is the town of Montalcino, home to attractions like the fortress of Montalcino, the cathedral, several churches, and the Abbey of Sant’Antimo, which make the town an ideal destination for weddings. Other spectacular civil wedding venues are located in the small town of Montepulciano, also in southern Tuscany and within a short distance of Pienza. Montepulciano’s hilltop location and its unique cityscape punctuated by medieval walls make the town a very special place. 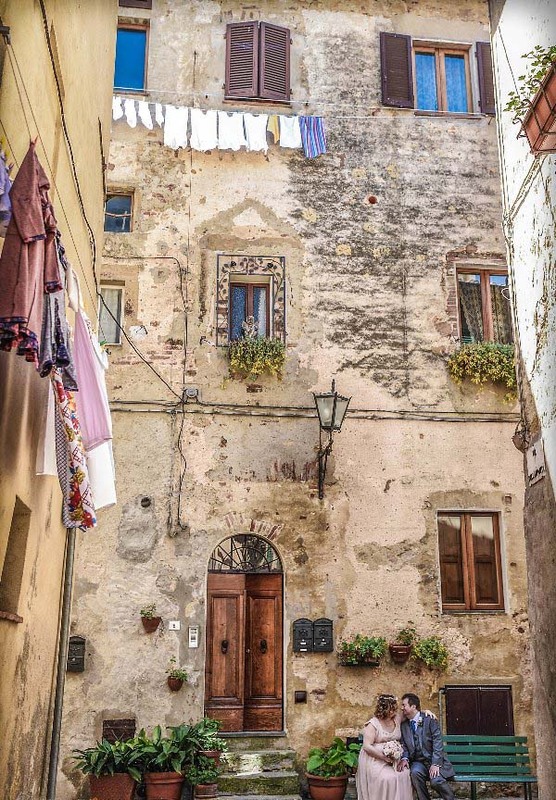 The town’s numerous Renaissance buildings, the castle, the Palazzo Pubblico, and the Madonna di San Biagio never fail to cast a spell on visitors, who are also often impressed by the town’s gorgeous private residences. Moreover, Montepulciano is especially popular among wine and music lovers. 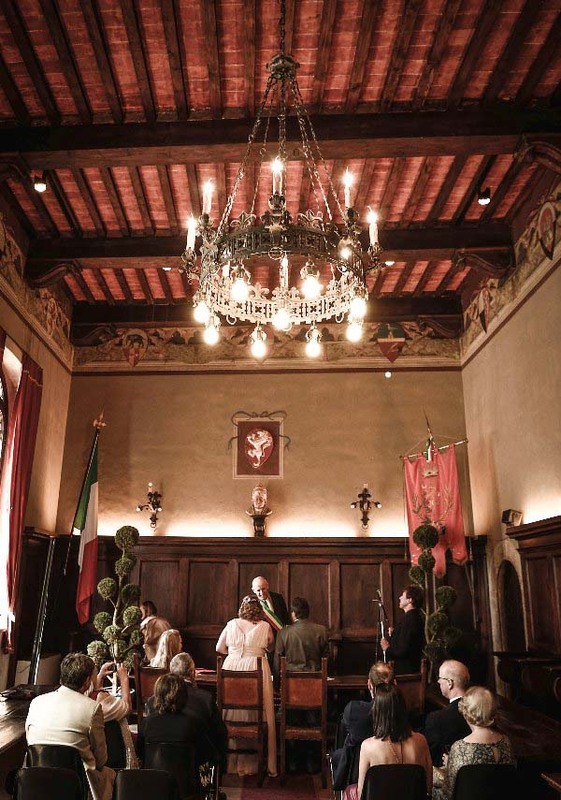 In addition to the province of Siena, Arezzo has many great wedding venues to offer. The town of Cortona is particularly noteworthy in this respect. Located in the Val di Chiana, Cortona is home to both numerous attractions (such as a cathedral, numerous churches and palaces, a fortress and a castle) and to unique civil wedding venues. Every village – whether Pienza, Montepulciano, Montalcino, or Cortona – has its own special and unique charm. We can gladly offer advice on the location that best fits your plans and wedding theme. 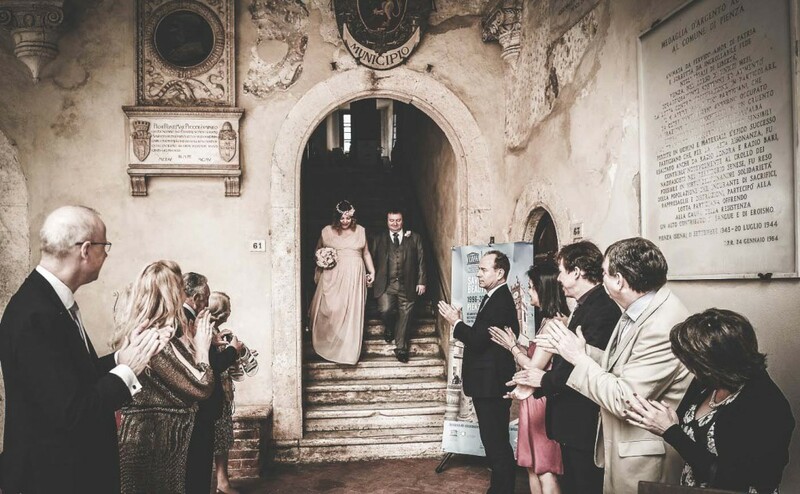 But regardless of which venue you choose, you can be sure that a civil wedding in southern Tuscany is guaranteed to be a unique and romantic experience! 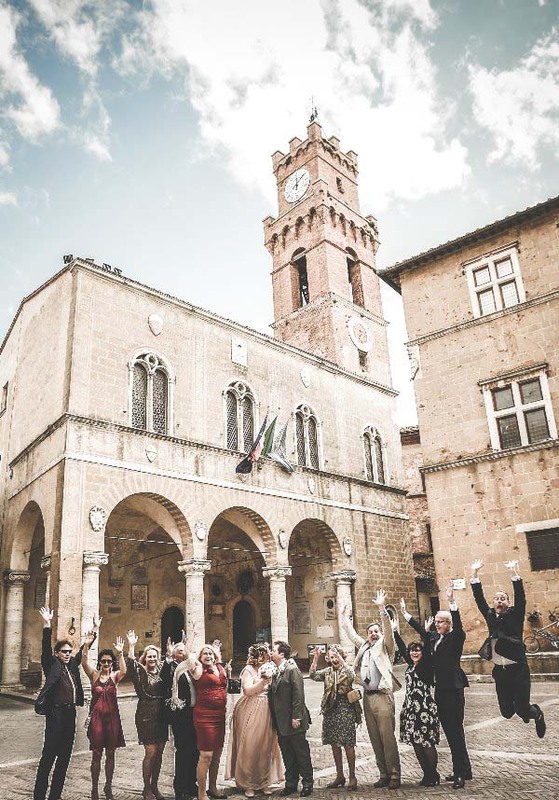 Our – in the photos featured – bridal couple Gianna and Paul arrived with close friends from London, Australia, and the United States to celebrate their intimate civil wedding in Pienza. After a romantic civil ceremony in a frescoed hall, the guests enjoyed an elegant wedding dinner reception in a luxury hotel right outside of the city.